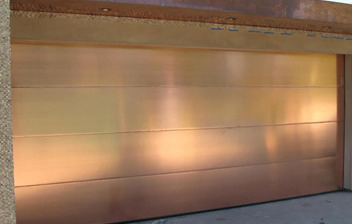 • ​Start with a 24 gauge commercial steel door. • ​90 degree folds over the sides, top, and bottom. if you can imagine we can build it! • Pre-rusted steel sealed for long lasting rustic garage door finish. • Stainless steel for long lasting modern garage door styling. • Kynar coated steel for a garage door finish guaranteed for life.